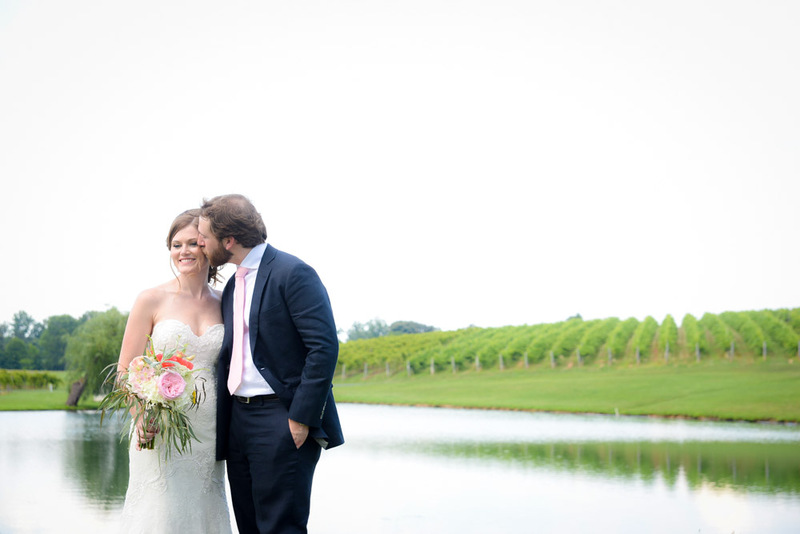 There’s always a first for everything and Saturday was once of those days at Keswick Vineyards. 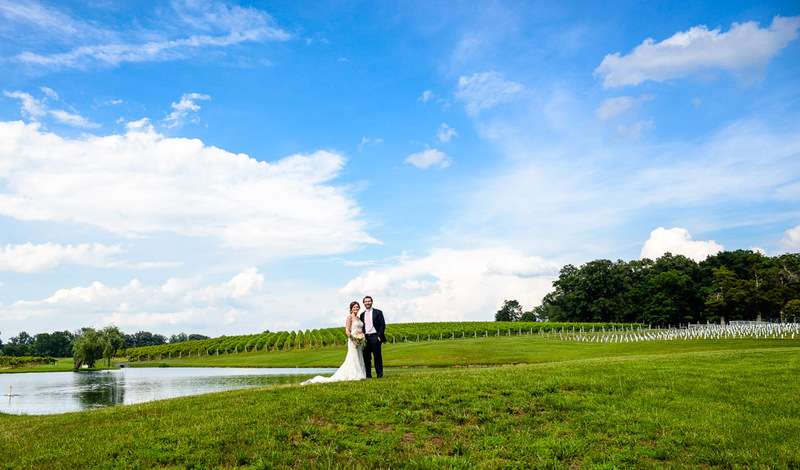 Meaghan & Eric were married at Keswick Vineyards on Saturday, June 20th. Unfortunately, Tropical Storm Bill was an uninvited guests for them. Earlier in the week, Tropical Storm Bill came ashore in Texas and slowly made its way towards Virginia. At Friday nights rehearsal Meaghan had already accepted that it would be raining on her wedding day. 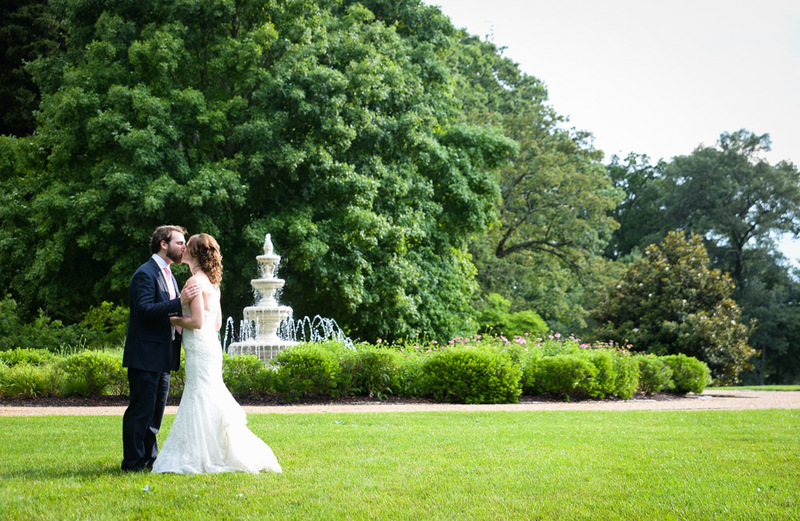 She was hopeful that she would still be able to have her ceremony outside but if not, she was good with our rain plan. Saturday came and the day started out just beautiful but we all new this was the calm before the storm. Knowing that we would be getting something that night we prepared the reception tent so it would be ready in case of a bad storm. We watched the radar closely and saw that we were going to be able to do the ceremony outside but then the bands of the storm would be hitting us. 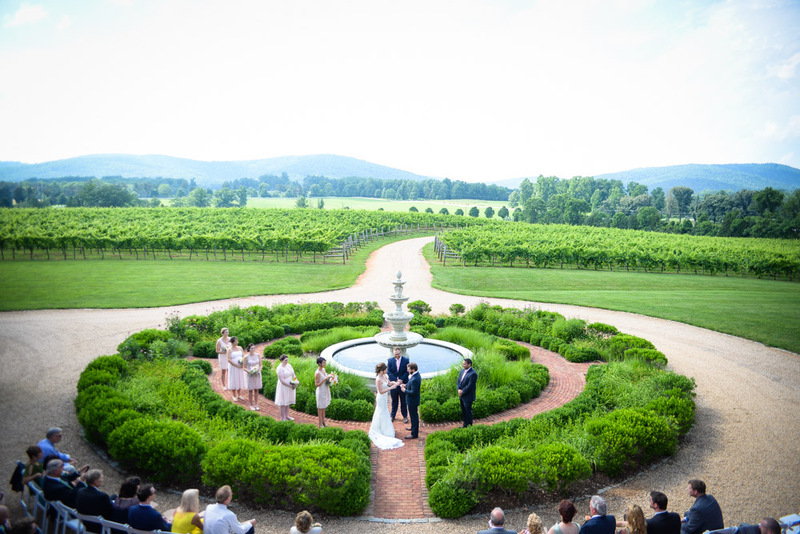 The ceremony was just beautiful in front of the fountain with the backdrop of the vineyard and mountains. We quickly headed out to get some photos down by the pond for it was a priority for Meaghan. Just as we were finishing the photos the rain started. We quickly road the golf cart back to the estate and joined the rest of the guests for cocktails under the tent to wait out the storm. This storm had some muscles to it. With the rain pouring down and the wind blowing we quickly got the sides on the tent to keep everyone dry. I’ve never seen rain come down like that except when I was in Florida for another tropical storm. Guests enjoyed themselves as they enjoyed cocktails and appetizers. Even the DJ got into the spirit of the storm by playing songs like “Rain Drops Keep Falling On My Head”. Once the storm blew threw we opened the sides of the tent an everyone went outside to see the double rainbow Mother Nature had giving us. I wasn’t able to get a photo of it but can’t wait to see what their photographer took. We got about a 30 minute break before another wave came threw but this time not as bad. Dinner was served just before that wave hit so guests were able to finish dinner while waiting that one out. After that wave we were good for the night so the sides came off the tent and everyone started to dance the rest of the night away. Late night snacks were provided along with a delicious dessert bar which included some chocolates from Michigan. Oh yah, did I forget to mention this couple was from Michigan??? I thought it was great that they made their entrance into the reception tent to the U of M fight song. 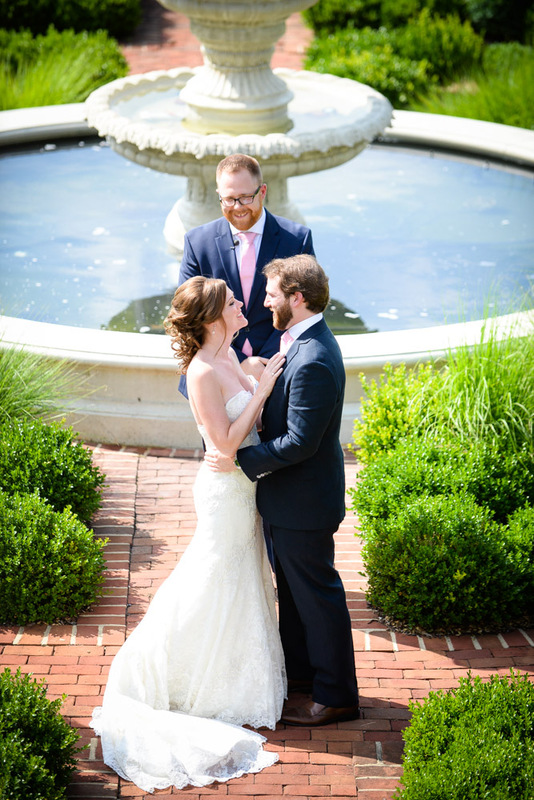 I’m sure Meaghan & Eric and their guests will always remember this wedding. The storm definitely added another element to the occasion. I will always remember what a great attitude they had towards the weather along with their guests. 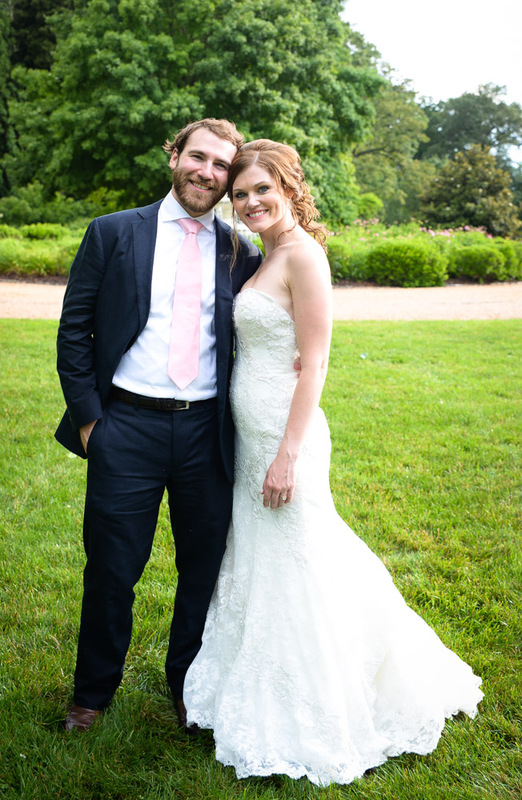 I’m not sure many couples would have such a carefree attitude and allow themselves to relax and enjoy their wedding day no matter what Mother Nature was throwing at them. I think with that attitude it made it a lot easier on all the vendors that worked so hard at doing everything possible to make this wedding be just as perfect with or without the storm. A special thank you for all the vendors for working so hard to pull off this wedding: Caterer Groovin’ Gourmets, Furniture Rentals by Paisley & Jade, DJ T.D. Layman of Sound Enforcement, Musicians Madison Trio during ceremony & cocktail hour, Photographer Don & Lindsey Mears of Don Mears Photography, Hair & Make-up by Lou Stevens Glam Squad, Verde Natural Florals, Albemarle Limousine, MS Rentals and Keswick Vineyards as Day Of Event Planner.